With this week truly testing my limits to stay awake after work only to address the additional editing that I have to get done, you could say that quick and easy comfort foods have been on my mind. 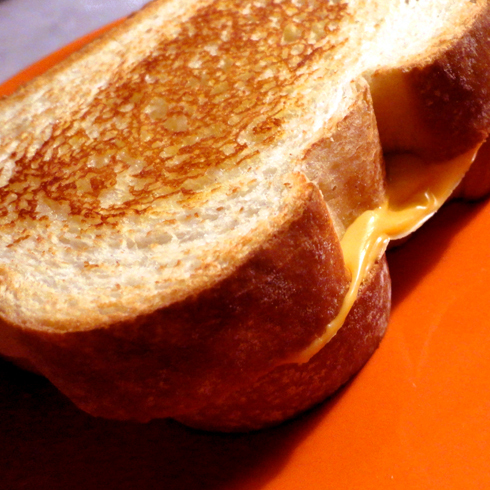 Grilled cheese has become a staple of my diet since my first year in film school, and maybe that has as much to do with why I still love it so much. How can you go wrong with bread and cheese anyway? No secret recipes, no tricks, just a couple thick slices of Italian bread and a Kraft single (or if I have it in the fridge, real mozzarella or cheddar). Come to think of it, I've got a lot of work to get done. I better have another. Check out some of the far more ambitious grilled cheese creations in the video below. Grilled cheese is AWESOME! Tastes good with a slice of pepperoni on it too.